When you talk about how much you like a tune, you don’t say: “That’s a great MP3”. You say: “That’s a great song”. The MP3 is the delivery mechanism, not the creative work; just as in type a font is the delivery mechanism and a typeface is the creative work. (from The FontFeed). My interest in typefaces started when we made The Liberator trailer. We wanted the typeface to be authentic from the time, the early 1800’s. Well, nearby are many graveyards, some dating back to the 1600’s. So I explored, found graves from the early 1800’s and took pictures of every letter and number. 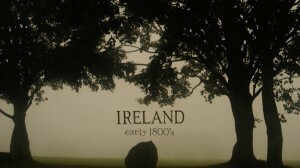 This image is from the trailer – the typeface appears many places in this piece. That was the seed, the seed that sprouted in my head. I show some newer experiments on my typeface page. Lately I have become interested in typefaces that change over time.Still just messing around, but here is an example.